There is nothing more comforting than tomato soup and grilled cheese sandwiches on a cold winter day. I'm not sure why I never made my own tomato soup before - my husband loves tomatoes. We both really enjoyed this soup - I enjoyed it more than I thought I would. I don't think I would like it as much on its own - it's more of a dip for my sandwich than anything else. 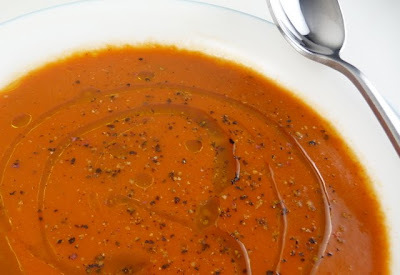 This is a cream-less version of tomato soup - which is a great way to cut calories - but I think I would prefer it with the extra richness that the cream provides. 1. Prep your sandwich bread by removing the crusts and cube into bite sized pieces. 2. Heat oil in a Dutch oven over medium-high heat then add onion, garlic, red pepper flakes and bay leaf. 3. Cook while stirring frequently, until onion is translucent, about 3 to 5 minutes. 4. Stir in the tomatoes and their juice, brown sugar and bread; bring soup to boil. Reduce heat to medium and cook, stirring occasionally with a potato masher, until bread is completely saturated and starts to break down. Remove and discard bay leaf. 5. Transfer the soup to blender or use a immersion blender in the pot and process until soup is smooth and creamy. 6. Return the soup into the dutch oven (if you transferred it to a blender) and stir in the chicken broth. Bring the soup to boil and season to taste with salt and pepper. Sprinkle each portion with pepper and drizzle with a garnish of olive oil. I love tomato soup but have not made it myself this way....blended. Would love to try making it myself one day.